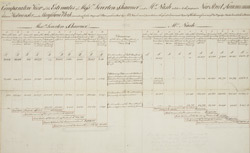 This table contains two sets of accounts prepared for the Commissioners of Woods, Forests and Land Revenue to compare the costs of alternative projects for Regent Street. The first was submitted by Leverton and Chawner and the second by John Nash. Nash, whose plans were chosen, managed to keep costs down by building Regent Street over existing routes. Where this proved impossible and land had to be purchased, with cheap land in Soho or the Crown Estate preferred to the expensive land in Mayfair.